As a business owner or high-ranking employee, learning to negotiate effectively in the business world is one of the most important skills you will ever need to employ. Successful negotiations often boast win-win outcomes and can benefit your company significantly, but if your negotiating skills are inadequate, you could be putting your business in serious jeopardy. 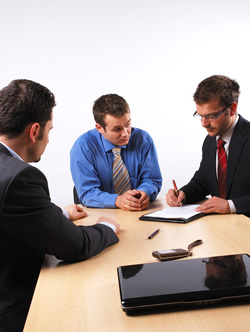 Below you will find some general tips to help you improve your negotiating skills. It is extremely important that you gather as much information as possible about the other parties involved in the negotiation process, as this information could give you a significant advantage during your discussions. Researching your competitors allows you to demonstrate to the parties with whom you’ll be negotiating why doing business with your company is preferable to doing business with your competitors. Furthermore, researching the other negotiating party (or parties) allows you to focus your negotiations on what is important to them, which will help to convince them to do business on your terms rather than theirs. Finally, it is important that you make an effort to be knowledgeable in a very general sense about all subject matter relevant to your negotiations. Research has indicated that if you appear authoritative on a subject, other parties will be innately inclined to follow your lead in an effort to avoid appearing unreasonable. So demonstrate your expertise, and give the other party every reason to trust you and defer to your terms. As with every delicate conversation, there are words and phrases in negotiation processes that you should avoid at all costs. The word “between,” for example, despite its common use in negotiations, is something you should concentrate on avoiding. It is tempting to give the other party a range of values to prove that you intend to be a reasonable and fair negotiator, but in doing so, you actually risk making unwanted concessions. If you offer someone a shipment of product for “between $30,00 and $40,000,” they are, of course, going to gravitate towards the lower value, and even most novice negotiators are smart enough to latch onto the lower value and ignore the higher end of the spectrum entirely. By doing so, they lead you to believe that the negotiations are still happening within your terms, and, oftentimes, they are able to shrewdly coax you even lower than what you originally thought was your lowest figure. By offering a “between” figure, you have unintentionally begun the negotiation with a concession. The very fact that you’re sitting in a negotiation implies that you and the other party are both willing to make concessions in order to produce a mutually satisfactory deal. Recognize that the other party- if they know the first thing about negotiations- will always ask for more than they actually expect to receive and that you, in turn, should always do the same. That way, even after both parties have made concessions, they still finish with satisfactory terms. The trick to negotiations is recognizing that a disparity exists between what is requested and what is expected and learning to estimate exactly what the other party actually expects to receive. This helps you to determine exactly what concessions you can convince them to make and on which points they’ll be unlikely to yield. Successful negotiation is a complicated process that takes both time and practice, but, by internalizing these tips, you will be well on your way to collecting the knowledge necessary to become a skilled negotiator. Remember that researching your competitors and your field, as well as the parties who will be sitting opposite you at the negotiating table, is an important step in ensuring successful terms. During the process itself, remember that you and the other party will both likely make initial offers that are well beyond what you expect to receive. Finally, avoid offering any “in between” figures, as this gives you an immediate disadvantage.